The EZ220-PLC and EZ420-PLC Series has been discontinued. Please see the OCSXL Series as a possible alternative or contact our Automation Engineering department. The Most SENSIBLE One-Piece Automation Controller for a Small Machine! EZTextPLC is the most powerful combination of a PLC and an Operator Interface in a very compact package. It utilizes EZPLC’s base and thus capable of all the features present in our EZPLC and uses our ‘mix-match’ modular EZ I/O to deliver a truly compact control. Where does it make sense? EZTextPLC can be used to configure a small control system that requires a Text type display. It eliminates the need to buy and install a PLC and Operator Interface separately and thus reduces the electrical panel space, makes the control system extremely compact and cost effective. With EZTextPLC starting at $482 for a 32 Digital I/O system (16 Dig In/16 Dig Out), it is built to compete in the market of Embedded controllers without the hassle of "C" level programming or proprietary microprocessor boards. EZTextPLC uses EZ I/O modules for I/O (starting at $31 for 8 Digital Out!) which can be chosen from a large variety of options including Analog I/O, High Speed Counter, Relay, Thermocouple, RTD, and AC/DC combo modules. With PLC Performance You Will Find Only in PLCs Costing Thousands More! The EZText PLC has two processors, one for handling the PLC and its I/O, and another co-processor for handling the HMI functions. Even though the two processors cost more, we wanted to make sure that you have one of the fastest PLCs on your machine. This Text Panel PLC rivals scantime specifications of the fastest full-blown PLCs. The EZText Enhanced programming software is a Windows-based program. The EZ-to-use screens and pull-down menus provide all tools you will need to select the panel type, configure the PLC communications, create text messages, etc. The EZText panels use simple addressing and bit assignments. Competitor text panels require extensive programming and associated ladder logic to make the pushbuttons and LEDs operable. The configuration screen contains all of the information needed to configure the pushbuttons and their associated LEDs. You can configure the pushbuttons in three different ways: alternate, momentary, or alternate with PLC release option. The associated LEDs, which can also operate totally independent of the pushbutton action, can be triggered three ways: by the associated pushbutton, by the PLC, or they can be made to flash by the pushbuttons. This screen also allows the user to enter the associated PLC address. Once the address assignment has been selected, all of the pushbutton and LED fields will be populated with the associated bit assignments. There are two message types which can be displayed: local and PLC. Local messages are displayed on the screen unless the PLC triggers a PLC message, which overrides a local message.. When a PLC message is triggered, the PLC Message LED will also be illuminated. The PLC message LED will remain on until the user acknowledges the situation by pressing [esc] on the panel. All EZTextPLC models are available with built-in high speed Ethernet TCP/IP communication interface in addition to RS232 and RS422/485 communication ports. This interface allows EZTextPLC to reside on a 10 Mbps TCP/IP network (10Base T Ethernet) via an RJ45 port. Use Ethernet models for easy Ethernet programming with 100 meters being the maximum distance between two nodes. For distances greater then 100 meters repeaters can be used to extend the distance between any two nodes. 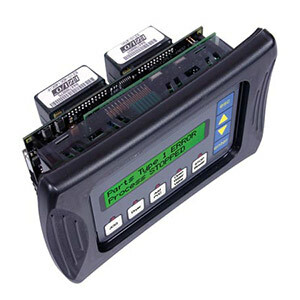 EZTextPLC models when ordered with built-in DeviceNet Slave communication interface provide DeviceNet connectivity in addition to RS232 and RS422/485 communication ports. DeviceNet communication interface for EZTextPLC provides a digital, multi-drop network that can be used for communicating with DeviceNet enabled controllers and I/O devices. On DeviceNet network every device acts as a node and allows multiple communication hierarchies and prioritization of messages. EZTextPLC with DeviceNet communication interface can be configured in a master-slave control architecture as a slave node and allows peer-peer communication. DeviceNet control system provides a single point of connection both for configuration and support for I/O as well as explicit messaging. All EZTextPLC models are available with built-in Profibus Slave communication interface in addition to RS232 and RS422/485 communication ports. This gives EZTextPLC the ability to link with a Profibus Master Controller. Profibus is a vendor independent open field bus protocol standard in manufacturing automation and process control. It reduces hard-wiring costs and provides specifications for information exchanged between nodes of a Profibus network. This communication interface provides the ability to transfer data between a Profibus master and EZTextPLC.The Profibus communication interface also has an auto-detect feature for the baud rate of the Profibus network. Small (32 I/O): 7.418 x 5 x 2.587"
Large (48 I/O): 10.018 x 5 x 2.587"
NOTE: Programming software (EZ-SERIES-PLC-EDIT) and programming cable (EZP-PGMCBL) required.